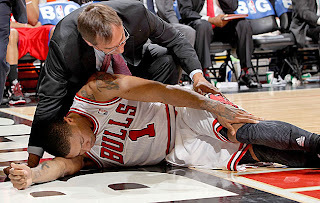 Chiropractic Care Limits Basketball Injuries! Clearly, a sport that requires tremendous power and speed will lend itself to injuries. And so it is with basketball. In fact, if you go by sheer numbers alone, basketball is the most injury-prone sport of any in the nation -- with the latest 2010 data from the U.S. Consumer Product Safety Commission showing its 528,584 reported injuries, topping even football's 489,676. Sidelining hoopsters were everything from back spasms to sprained ankles. That explains why so many professional teams -- across the sports world -- are now makingchiropractic care part of their health regimens. "It helps give teams and athletes a competitive advantage by assisting in the recovery from many structural injuries, putting them in a position to enhance endurance levels and achieve overall peak performance," says Dr. Craig Buhler, who was the chiropractor for the Utah Jazz during a time when they had the lowest injury rate of any team in the NBA. "I've personally seen how athletes are recognizing the value it has in accomplishing their goals of staying in the game and playing at their best," adds the avid supporter of the Foundation for Chiropractic Progress. Would any of you expect me to put a picture of a basketball player that wasn't on the Bulls? You knew that wouldn't happen! Once D-Rose gets healthy, they sign Tom McChesney, Josh Brooks, and Todd Dersham, the Heat will be yesterday's news!